The Nova Scotia Department of Transportation issued a public tender for upgrading on Highway 101 in August of 2005. In addition to signage and lighting updates, the project consisted of ditching, stream realignment and the supply and installation of underground drainage structures. 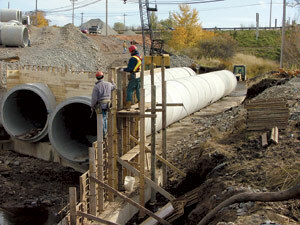 Alva Construction Limited was the succesful bidder and chose Strescon as their concrete pipe supplier. The tender was awarded in late August and Alva was ready for pipe in September. The stream realignment portion of the project consisted of twin 84" and 48" diameter culverts including factory installed fish baffles. 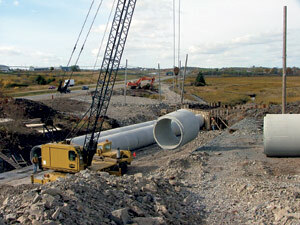 The 48" pipe was produced and delivered to the site for installation while excavation was being done for the 84" culvert. Strescon then delivered the 46 pieces of 84" ( 16 loads ) within two days so the contractor was able to offload and stockpile the pipe on site without an additional crane rental.